Chinese philosophy is missing from U.S. philosophy departments. Should we care? Philosophy has been a favorite whipping boy in the culture wars since 399 B.C., when an Athenian jury sentenced Socrates to death. Nowadays, philosophers are no longer accused of “corrupting the youth.” Instead, a surprisingly wide range of pundits, from celebrity scientist Neil deGrasse Tyson to former GOP presidential candidate Marco Rubio, assert that philosophy is pointless or impractical. In reality, philosophy majors do strikingly well on standardized tests for graduate school. In addition, many successful CEOs and entrepreneurs majored in philosophy. Although the critics of academic philosophy may be mistaken about where the problem is, the truth is that departments are failing their students in some critical ways. Departments of philosophy across the United States almost universally neglect the profound, fascinating and increasingly relevant philosophy that is outside the traditional Anglo-European canon. Africana, Indian and Islamic philosophy is all largely ignored. My own experience has led me to be particularly concerned about the failure of philosophy departments to engage with Chinese philosophy. In 1985, I was a college senior who wanted to continue my education by earning a doctorate in Chinese philosophy. At that time, it was almost impossible to find top philosophy departments in the U.S. that taught Chinese thought. I had only two choices: University of Michigan and Stanford University. Today, neither of the two institutions has anyone in their philosophy departments teaching Chinese thought anymore. So how bad is the problem? And why should we care? What is missing from the philosophical curriculum? Consider the current coverage of Chinese philosophy by U.S. universities. Among the top 50 philosophy departments in the U.S. that grant a Ph.D., only four have a member of their regular faculty who teaches Chinese philosophy: Duke University, University of California at Berkeley, University of California at Riverside and University of Connecticut. At an additional two institutions (Georgetown University and Indiana University at Bloomington), the philosophy department has agreed to allow members of another department (Religious Studies and Theology, respectively) to list their courses as philosophy. In contrast, every one of the top 50 schools has at least one regular member of the philosophy department who can lecture competently on Parmenides, a pre-Socratic Greek philosopher. His only surviving work is a poem filled with cryptic utterances like, “for not to be said and not to be thought / is it that it is not.” Is this really more profound than everything in Chinese philosophy? Why is the lack of coverage of Chinese philosophy by U.S. universities problematic? There are at least three reasons. First, China is an increasingly important world power, both economically and geopolitically – and traditional philosophy is of continuing relevance. President Xi Jinping has repeatedly praised Confucius, the influential Chinese philosopher who lived around 500 B.C. 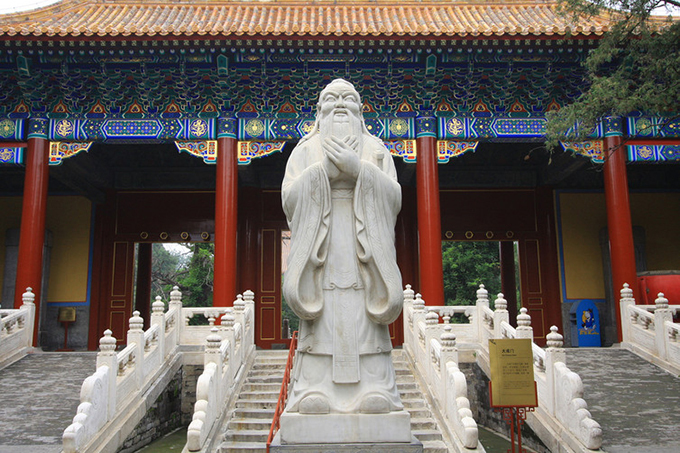 Confucius is comparable in historical influence to the Buddha, Jesus and Socrates. Also like them, he has been variously interpreted, sometimes idolized and other times demonized. At the beginning of the 20th century, some Chinese modernizers claimed that Confucianism was authoritarian and dogmatic at its core. Others have suggested that Confucianism provides a meritocratic alternative to Western liberal democracy. “New Confucians” claim that Confucianism represents a distinct teaching that can both learn from and contribute to Western philosophy. Thinking about these issues is important in understanding China’s present and future. 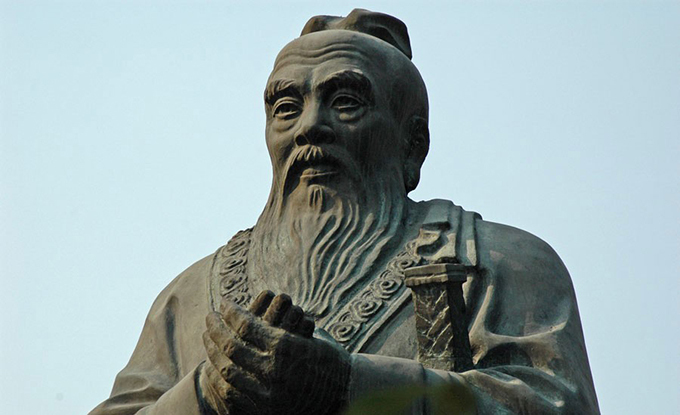 How will the next generation of diplomats, senators, representatives and presidents (not to mention informed citizens) learn about Confucius and his role in China as a political thinker? Second, Chinese philosophy has much to offer simply as philosophy. Late Supreme Court Justice Antonin Scalia expressed a common misconception about Chinese philosophy. He dismissed it as the “mystical aphorisms of the fortune cookie.” Scalia went on to denigrate Chinese philosophy as nothing but “poetry or inspirational pop-philosophy” that lacks “logic and precision.” In reality, Chinese philosophy is rich in persuasive argumentation and careful analysis. For example, an academic at Georgetown University, Erin Cline, has shown how Confucian views of “filial piety” are relevant to contemporary ethics. Cline demonstrates that Confucian ethics can provide a deeper understanding of ethical issues regarding the family and can even inform specific policy recommendations. A more abstract, but equally valuable, aspect of Chinese thought is explored by Graham Priest, currently at City University of New York. Priest has demonstrated that Chinese Buddhism can challenge the common Western view of selves as radically independent individuals. Graham, a logician, uses advanced mathematical models to explain and defend the Buddhist claim that the self is transpersonal rather than individual. …academic philosophy in the United States has a diversity problem. … Among U.S. citizens and permanent residents receiving philosophy PhDs in this country, 86 percent are non-Hispanic white. Both my own experience and that of many of my colleagues suggest that part of the reason for this is that students of color are confronted with a curriculum that is almost monolithically European. How significant is the ‘pipeline problem’? I recently discussed the neglect of Chinese philosophy with a leading expert on ancient Western philosophy. She worried: where would philosophy departments find people who both knew philosophy and could actually read Classical Chinese? In other words, she argued that the pipeline of competent specialists in Chinese philosophy is too narrow to effect anything more than incremental change. Certainly, there are very few universities even capable of training professors to teach Chinese philosophy. This creates a vicious cycle. Few institutions teach Chinese philosophy, so there are few recent Ph.D.s in Chinese philosophy for institutions to hire. As a result, the number of institutions that teach Chinese philosophy does not increase. I believe that, although the pipeline problem is real, the emphasis on it is mistaken. There are enough strong scholars currently doing research that we could double the number of top institutions teaching Chinese philosophy overnight if there were the will to do so. Just one of the professional groups devoted to the study of Chinese philosophy, the Society for Asian and Comparative Philosophy, has over 600 members. Most mainstream philosophers show no interest in learning anything about Chinese philosophy. I was recently part of an invited panel at the American Philosophical Association that was specifically advertised as an opportunity for nonspecialists to learn about Chinese philosophy. 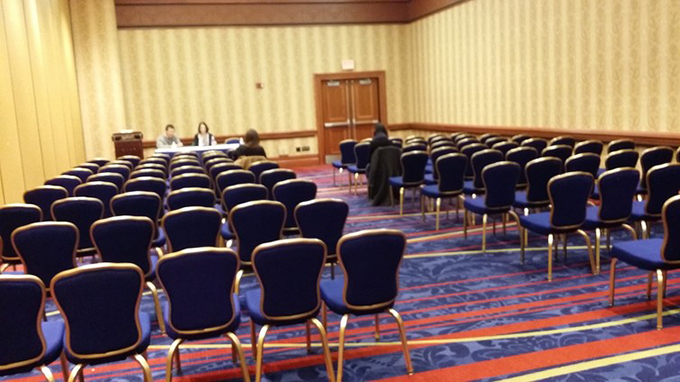 Here is a photo I took of what the room looked like at the start of the panel. Most philosophy departments are unwilling to even admit that there is anything outside of the European philosophical tradition that is worth studying. Ironically, philosophers who narrowly study the Western tradition are not being true to it. The ancient philosopher Diogenes was asked what his home was, and he replied, “I am a citizen of the world.” Contemporary philosophers who refuse to engage with Chinese thought are betraying the cosmopolitan ideal at the heart of Western philosophy.